Quotations from the special TV programme Gica has been invited at "CNN Turk"
"I chosed Galatasaray after Barcelona not because of money.There were other reasons...First, I was 31 and I played far away from my country for 6 years I preferred to be close to my home.Second, Galatasaray was the team which wanted me most and lastly we have similar thoughts...Champion who always wants to win..."
What did Galatasaray give you?
" 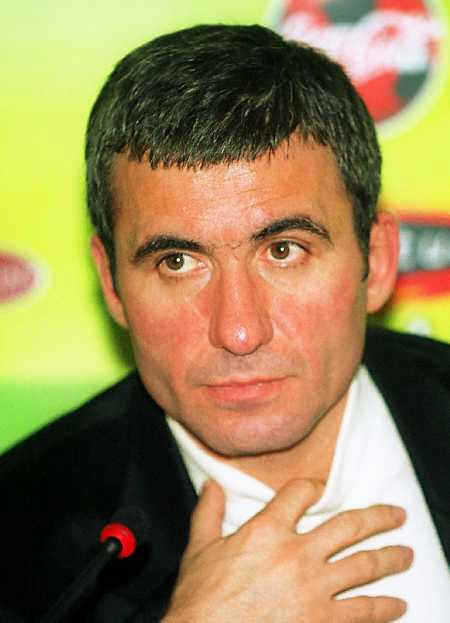 Galatasaray did a very good job by signing contract with "Hagi".This marriage make both of us gain more prestige." What about your unforgettable momemts? "There are a lot of moments but I first remeber UEFA Final because there was a great responsibility on me since I was sent off.Then the goal I scored against Athletico Bilbao at 90th minute.The penalty I scored at Leeds.Monaco and Dortmund matches...And also Bursaspor and Altay goalkeepers should know me very well...(he laughes)"
Do you agree that everyone loves you ? "I can not say anything about that.I am not the person to confirm that.I love everyone.And more important than love, I respect everyone.Ask the rest to them...But at least I know my wife loves me...Thats enough for me..(he laughes)"
"Yes...I am tired of media etc. but not playing football." You argue with the referees.Are you always right and are they always wrong?
" I grew up with respect.I didn't do anything for the past 4 years.But unfortunately, this image is given to me by the media.Other people may like or not, may accept or not but personally I can not stand injustice.I am here for 5 years...Does anyone know how much faults Hagi was exposed to?All opponents' coaches give at least a player to mark me and they say "You will even go to toilet with him." Does any of those players face any cards? As far as I remember, none of them were shown a card this year.I just ask them why they do not show a card to the player who make faults to me. But there are huge propagandas and those affect the referees.That's a strategy to stop Galatasaray. I am a player who wants to play football, I don't mark anyone but if the referees don't intervene, how can I stand?" What do you plan to do after your retirement? "First I want to have a short rest then I want to be a coach." "Why not? I am willing to work for Galatasaray with pleasure just as I did at past years.But my willingness is not enough they must also want me. (he laughes)"
" Great players feel the responsibility of team's being unsuccessful, much more.Hagi is not aggressive , he is ambitious." "I'm proud of this victory. We tried to win the game in the second half and all my friends did their best. Fatih Akyel played especially well and created two goals." "I even don't want to call this person a referee, he is a thief.He tried to stole points from us but we didn't let.Some people don't want us to be the champions.If they want this that much we can give it as a gift." “We did our best to beat Milan. All the people know how strong Milan is. But we played well and got a real victory against them. I congratulate all my team-mates." Hagi said getting three points is very important for them and he is very happy for this.They asked him whether they guarenteed semi-finals or not.He said "Nooooooooo...Noooooo" :))) "Let's talk these after Milan match." The interviewer said that "Today is Valentines Day.What do you think about it?" Hagi was surprised with this question.He laughed and said "I am kissing everyone.."
During a train the third goalkeeper Mehmet was laughing after a goal which was scored mainly due to his mistake and Hagi got angry and warned him strictly. "Why do you laugh? Am I laughing? Take your job serious and try to correct your mistake." About to return in Romania: "I say that in spite of my love for the country and for Romanian football in general. I was always a man who fought for my country's colors, and I would have died on the pitch to help the national team, but I will not go anywhere near these people who are not interested in football, but only in making money from the talent of the players." Hagi said about the draws of quarter finals: "I want Arsenal as our next opponents," declared the Galatasaray midfielder, who was sent off when the sides last met in the 2000 Uefa Cup final. The Romania legend added: "I was shown the red card and I have never forgotten that. I still want to show people I have something to offer, so I hope we can be drawn to face Arsenal. Hagi said he would play for Romania, and not for the World XI at his gala. "I retire from the national team, so I'll play the whole match only for it." "Son arzum Galatasaray ile 5. şampiyonluk. Aslında iki tane istiyordum, ama şanssız bir şekilde Real Madrid'e elendik. En sevdiğim şeyi iyi anılarla ve mutlu bir şekilde bırakmak istiyorum. Türkiye'de yaşadığım yıllar bana hep mutluluk verdi. Beşinci şampiyonluğumuz da benim için iyi bir veda hediyesi olacak. Son bir yılını futbolla dolu dolu geçirmek istediğini söyleyen Rumen süperstar, jübile heyecanını ilk futbol oynadığı dönemdeki heyecanına benzeterek, "Tuhaf ama, garip duyguları hissediyorum. Bazı şeylerin sonuna geliyorum, bunun farkındayım. 36 ya da 37 yaşında olmak, futbol için yaşlı sayılsa da, yaşayacağınız hayat için aslında çok genç bir yaş"